Imagine being able to make these polymer clay art beads in any size, shape or colour you want. You can easily learn how. 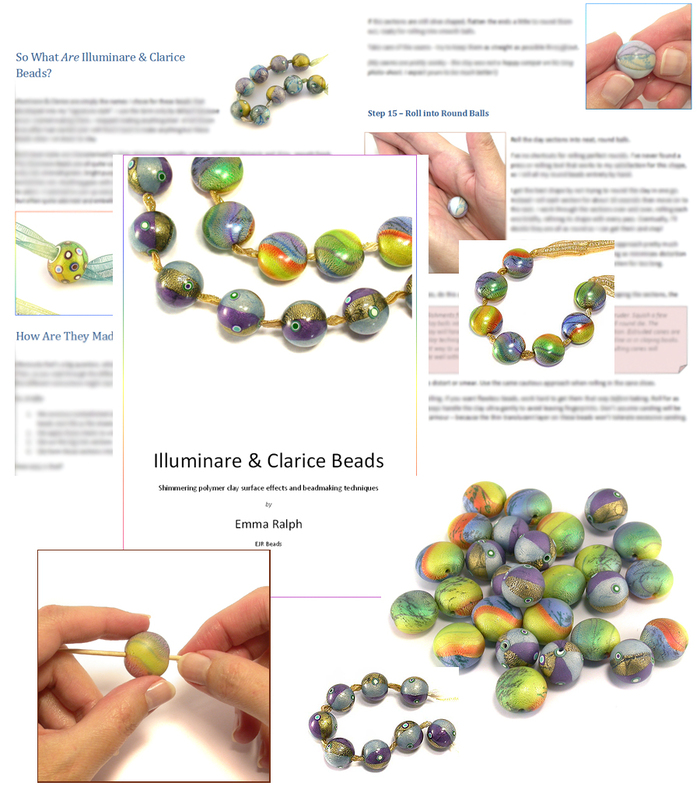 Get instant access to my Illuminare & Clarice Beads downloadable PDF coursebook plus optional live one-to-one support from me (as much or as little as you require) via email or using our private area on The Polyclay Forum. Work through the course material at your own pace - there are no obligations or coursework to complete. The file contains two full bead-making tutorials to master, plus much more besides. If and when you need my guidance or wish for me to critique your progress, this is available personally tailored to your needs. You call the shots! I can help you via email or real-time through our room over at The Polyclay Forum. You may also join our regular web discussions and network with other students of these techniques. In this home study package, you will learn exactly how to make my Illuminare and Clarice beads as I walk you step-by-step through making both bead sets pictured. Because you'll want to know the entire process from start to finish, nothing is missed out. The downloadable PDF course material e-book also contains detailed chapters on how to shape, sand and finish the beads to perfection. I don’t just tell you what I do - you'll see exactly how I do it, in incredible detail! The PDF includes over 45 pages and over 90 colour photographs! Learn the EASIEST way to sand beads - you don't even need to be there, its so easy! Learn the best way to varnish beads for a professional finish with no drips! Click here for example images from the downloadable course material! - Illuminare Beads tutorial – full step-by-step instructions for making my classic round Illuminare beads with their “beach ball” effect stripes. - How to varnish beads to perfection with no drips or brush marks. *** Plus *** free access to the member’s only lounge at The Polyclay Forum. Here we have a private area set aside for further interactive, discussion on the techniques with regular live question & answer sessions with me, your tutor. Just sign up at the forum and ask me for access to the member's only area. *** Plus *** unlimited, one-on-one, personal support from me, your tutor. If you have any questions on the techniques I'll be on hand via email or the forum to work with you individually as you learn these cool polymer clay techniques. These are intermediate level tutorials. You will need basic polymer clay skills, including rolling logs and sheets to specific dimensions, making and reducing millefiori canes and a general confidence in handling the clay. Please note – this home study course is a NON-REFUNDABLE item. If you have any questions, please ask them before ordering. The supporting tutorials are copyrighted material. In purchasing, you agree not to share, copy or distribute this information in anyway. If you do not agree to these terms, please do not purchase – thank you! Check out the weblink below for images from the course material! No Shipping costs are charged for this item if ordered alone.